Thread: "We do not know what this pan was used for. Do you have an idea?" 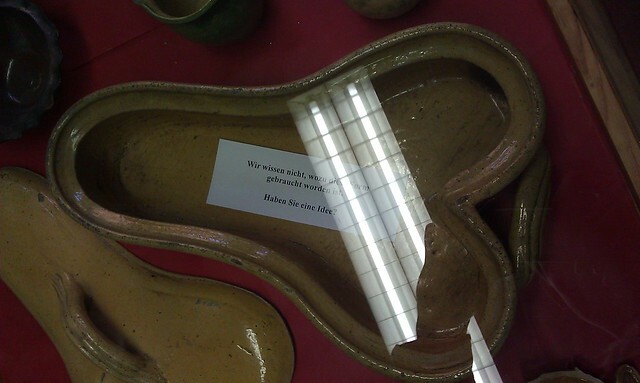 So says the note on this 18th or 19th century cooking item that is currently on display at a local museum. So what do you think? Phallic cakes? It makes you wonder who would serve it up? Well, I know what I'D use it for. Oh, I've seen those before. I always joked that they were bed pans for men. The round ones, of course, are bed pans for ladies. Yeah, my first thought was that it was a chamber pot. My first thought was bedpan. How big is it? I mean, the potential uses differ based on whether it's 6" long or 18" long.